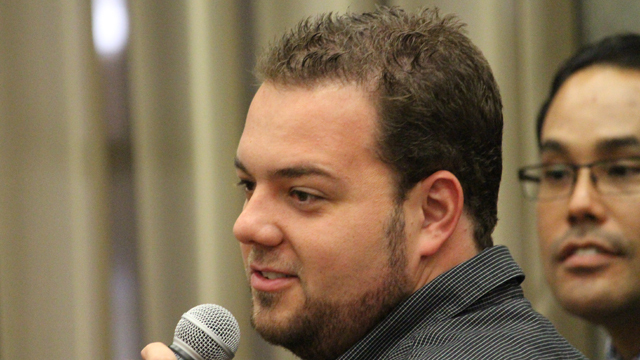 Cosponsored by Brazil's Agency for Industrial Development, the event was held at UCLA's Charles E. Young Research Library and attended by over 50 Brazilians living and working in Southern California. 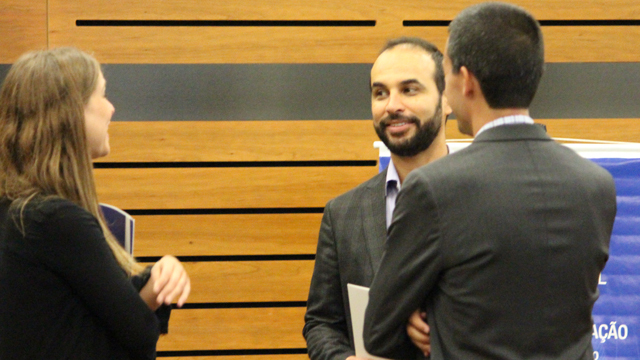 Flavio Cruz, UCLA Chemical and Biomolecular Engineering PhD candidate networks with other participants. Bruno Bath, consul general of Brazil in Los Angeles; Kathryn Atchison, UCLA vice provost, new collaborative initiatives; Dr. Karin Nielsen, clinical professor of pediatrics, David Geffen School of Medicine, and director, Center for Brazilian Studies; and Lanna Dioum, senior analyst of international projects, ABDI at the Opening Ceremony. 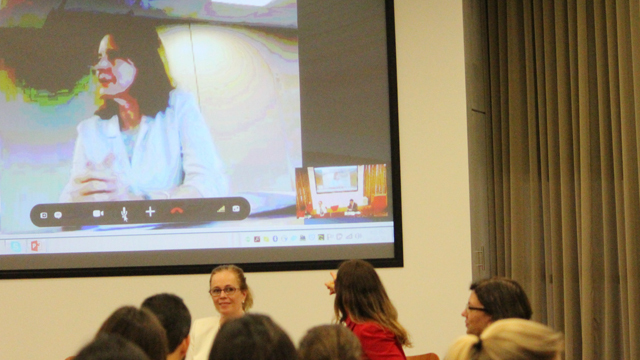 Maria Luisa Campos Machado Leal, director of innovation and technology, ABDI, via teleconference. 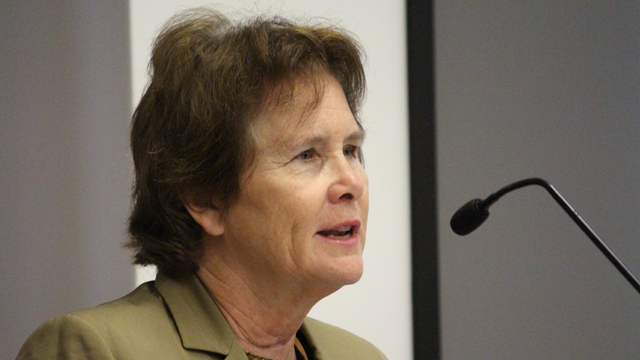 UCLA Vice Provost Kathryn Atchison gives her opening remarks. 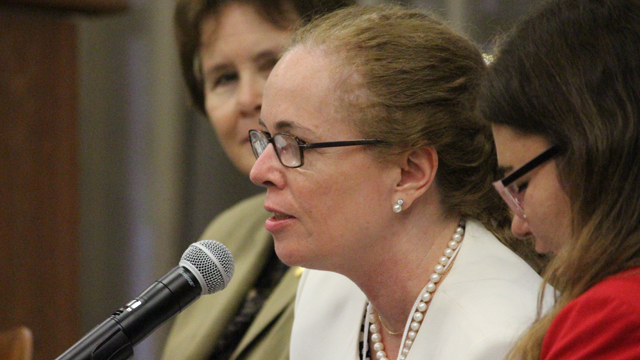 Dr. Karin Nielsen with UCLA Vice Provost Kathryn Atchison (left) and ABDI Senior Analyst Lanna Dioum (right). 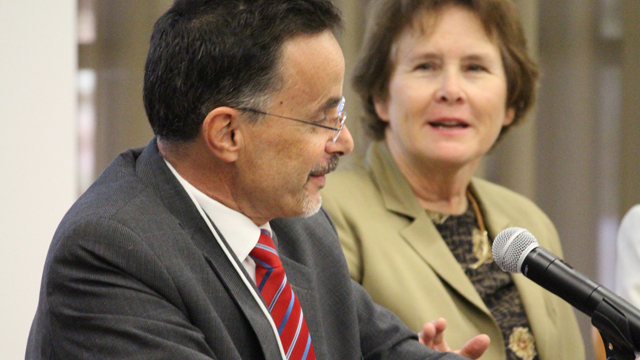 Bruno Bath, consul general of Brazil in Los Angeles and UCLA Vice Provost Kathryn Atchison at the opening ceremony. 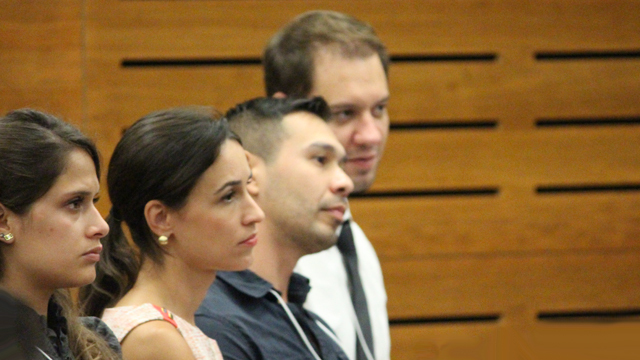 Mariana Figueiredo Uchoa, PhD candidate, USC; Ticiana Valle, Caue Matta; and Marcos Carvalho, Consulate-General of Brazil in Los Angeles. 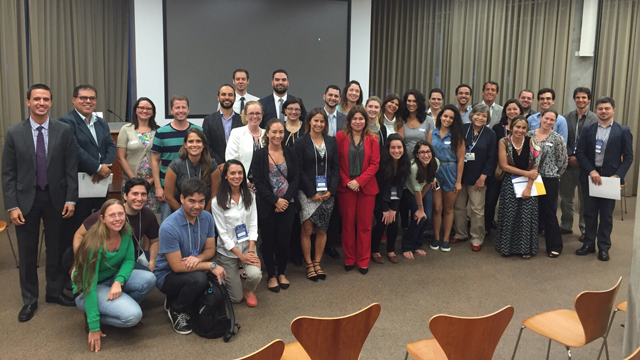 UCLA BSMP (Brazil Scientific Mobility Program) students Rogerio Pompermayer and Rafaella Keppen. Lucas Judice, CEO, MidStage Ventures; and Dr.Satiro Oliveira, UCLA Blood and Marrow Transplant Center and UCLA Pediatric Leukemia and Lymphoma Center. 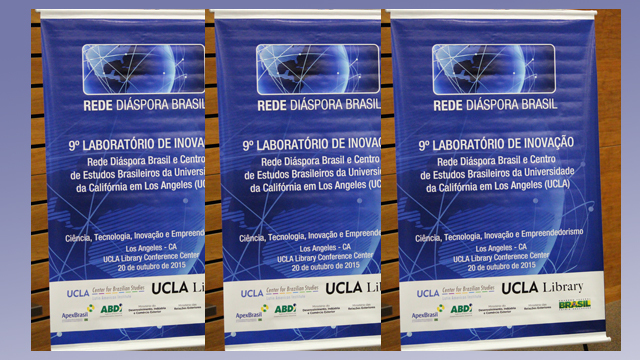 UCLA International Institute, October 27, 2015 — The UCLA Center for Brazilian Studies (CBS) and the Brazilian Agency for Industrial Development (Agência Brasileira de Desenvolvimento Industrial, or ABDI) cohosted the “Ninth Innovation Laboratory Rede Diaspora Brazil and UCLA” on Tuesday, October 20, 2015. 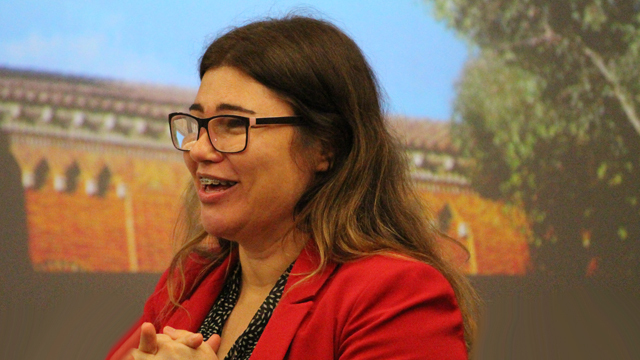 CBS Director Dr. Karin Nielsen, pediatric infectious disease specialist, professor at the Geffen School of Medicine and director of the UCLA Center for Brazilian Studies, and Lanna Dioum, senior analyst of international projects at ABDI, led the event. Dr. Nielsen was awarded ABDI’s 2014 Diaspora Prize in the health sciences this spring, when ABDI hosted her for a week of events in Brasilia. Attended by over 50 participants, the successful event sought to bring together Brazilian expatriates, professionals in the areas of health sciences, engineering and technology, and business/entrepreneurial activities to brainstorm about specific issues related to Brazilian development, as well as to acquaint them with the work of ABDI and the Diaspora award. Friends of Brazil who work extensively in Brazil and are fluent in Portuguese were also invited. Participants included Brazilian and Brazilianist scholars, faculty, and graduate students at UCLA, USC, Cal Tech, and UCSD, as well as graduate and undergraduate students in UCLA BSMP (Brazilian Scientific Mobility Program) and leading Brazilian professionals from companies such as Amgen, Kaiser Permanente, Rand Corporation and Embratur, from various locations such as Los Angeles, Thousand Oaks, San Francisco, San Diego and Washington, DC. After opening remarks by Kathryn Atchison of UCLA (Vice-Provost for International Initiatives) and, via Skype, Maria Luisa Campos Machado Leal of ABDI (Director of Technology and Innovation Development), Consul General of Brazil in Los Angeles Ambassador Bruno Bath and Dr. Karin Nielsen welcomed participants to a workshop that featured discussions and networking. Two senior ABDI analysts, Lanna Dioum and Rodolfo Milhomem, provided attendees with an overview of ABDI’s international projects. 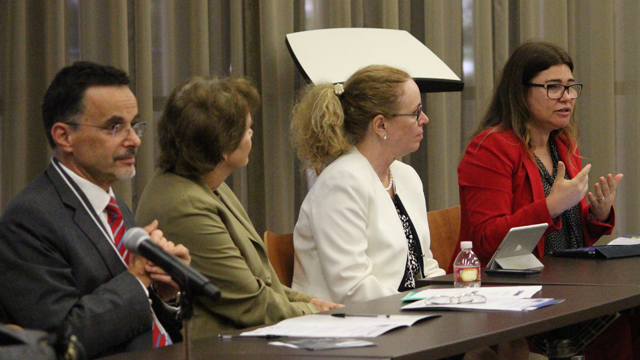 Over the course of the afternoon, attendees participated in two panel discussions on health and technology and the potential for collaborative projects, respectively. 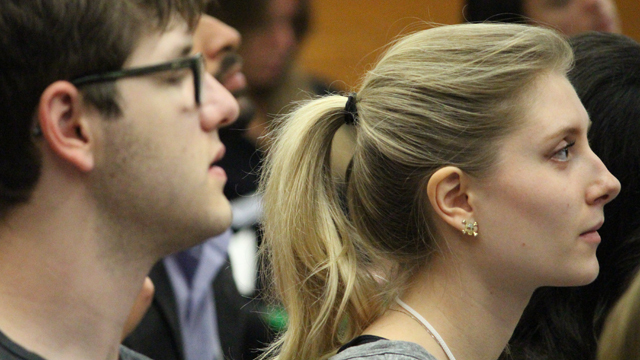 The lively discussions actively engaged participants in informative give-and-take exchanges. Speakers included Dr. Marcia de Souza Lima of the Global Network for Neglected Tropical Diseases at the Sabin Vaccine Institute, Washington, DC (and a previous winner of the Diaspora Highlights Prize for engagement with the diaspora); Dr. Gustavo Buchele of Amgen Inc.; Dr. Jair Lage, professor of pharmacology and biotechnology at UCSD; Alex Nascimento of 7 Marketing Media, Los Angeles; Natalia Aranovich, Brazilian attorney and foreign legal consultant registered at the State Bar of California; Lucas Judice of MidStage Ventures; Felipe Cusnir, international trade specialist, Los Angeles’ Mayor’s Office; Flavio Cruz, UCLA PhD candidate, and Tatiana Hochgreb-Hägele of the Lemann Foundation and the SciBr Foundation in San Francisco. UCLA faculty who addressed the gathering included Dr. Karin Nielsen, Dr. Satiro de Oliveira of UCLA’s Blood and Marrow Transplant Center and Pediatric Leukemia and Lymphoma Center, as well as Professor James Macinko of the Fielding School of Public Health. A mid-day coffee break and evening cocktail reception provided informal opportunities for participants to network and converse, laying the foundations for possible future collaborations and joint ventures with one another and their peers in Brazil. *All photos by Peggy McInerny/ UCLA.